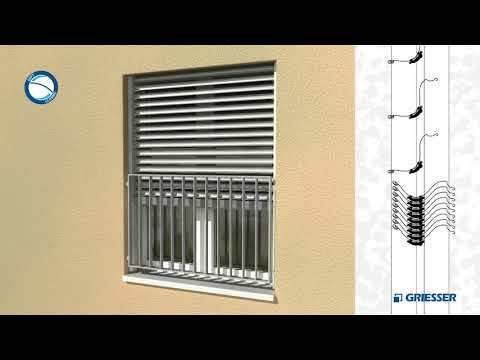 METALUNIC V All-metal external venetian blind with beaded slats All-metal construction with self-supporting slats. Lifting and adjustment mechanism integrated in the lateral guides. Lateral lifting mechanism with roller chain made of steel. Stainless hinge chain for slat position in every blind position. Lowering position in 2 variants, raising the blinds in brightness position with horizontal slats. Good shading function. Safety locking device in every position. Safety sensing edge prevents the destruction of the blind when running up against obstacles. Slats bordered on both sides with rolled-in, noise-insulating sealing lip. Baked enamel finish in Premium Colors. Lateral guide rails (85x45 mm) for direct installation made of extruded aluminum, transparently anodized. With noise-insulating plastic glides on the pivot arms. Upper rails (housing) of galvanized sheet steel with convenience motor (option: Comfort Drive) or articulated crank drive for the lifting and turning system.